Last evening we saw the #6 University of Houston Cougars beat UConn 42-14. While UConn waits for Midnight Madness to kick off basketball season, the Cougars are still untested with Louisville on the horizon. Speaking of basketball, also waiting for Midnight Madness is Kanas who lost to Texas No Defense Tech 55-19. But Kliff looked good as usual. Tonight we have the Cardinal of #7 Stanford playing the #10 Washington Huskies at 8:00 on ESPN in a Battle for the Pac 12. Go Brainiacs and Christian. Saturday begins with THE University of Texas at Stillwater playing Oklahoma State Cowboys at 11:00 on ABC. Just a reminder to Longhorns – the only team you have beaten this season was defeated last week by Duke – a basketball school. Pistol Pete has got this one. AT 4:00 on Fox we have Oklahoma and TCU in Fort Worth. Loser has to stay in The Big 12 Conference. ESPN brings us Alabama and Kentucky at 6:00 – Kentucky is waiting for basketball. Roll Tide. Louisville and Clemson – Prepare for a clash of Cardinals and Tigers on ABC at 7:00. Go Lamar. The ABC 2:30 game boasts of Wisconsin and Michigan. Unbeatens at 4-0 in Michigan Stadium should be a good one. Go Wolverines. The SEC East has Tennessee and Georgia – 2:30 on CBS. Both teams have something to prove and the Vols, Smokey the Dog, and Rocky Top are headed to College Station next weekend. Tigers and Tigers pit LSU and Missouri on SEC Network at 6:30. Leonard, your Heisman chances are slip sliding away. 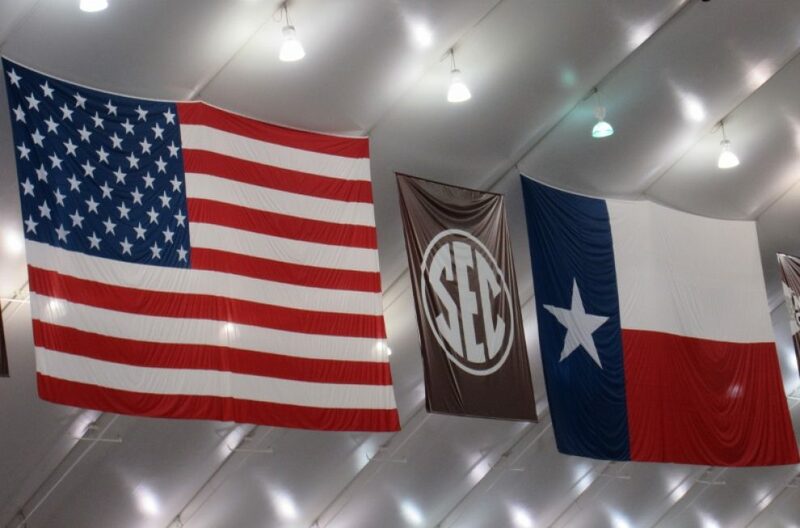 Texas Aggies and South Carolina at 3:00 on the SEC Network – The Aggies versus the Chickens. OK, they call it a Gamecock. It is still a chicken. Please let Uncle Will Muschamp’s head explode over something. We so like to see him spewing forth all cuss words than are easy to lip read. Gamecocks fail to put points on the scoreboard against the Aggie defense. South Carolina waits for Dawn Staley and women’s basketball. Say “Hurricane Carla” to anyone who was living along the Texas or Gulf Coast in 1961 and the memories come forth. I was twelve years old. There were three television channels that showed fuzzy black and white pictures of a huge storm approaching. Most the town of Magnolia, Texas moved into the high school. Besides Celeste’s house, the school buildings were the only brick buildings in town. One special memory stands out for me. Not the horizontal rains, or the high winds blowing down trees in all directions, but Hurricane Mama. Photo by HB – 1961. Had to be a Sunday. Why else would I be in a dress? Communications were limited to transistor radios (Google it) and there were very few of those. Nevertheless, those in the shelter learned the eye of the storm was approaching. When the eye approached, I knew there would be an extraordinary calm. It was as though the storm took a deep breath before continuing. During the calm I ran outside the doors by the science and home ec classrooms, turned left in front of the school and ran all the way to the front of the auditorium and reentered the building. About the time I got down the hall to Mr. Lyon’s, Mr. Tergerson’s and Celeste’s offices, my Mama met me and dragged me by one arm back to the family while giving me a tongue lashing worthy of the rest of the storm about to pass. But I smiled the entire time. Fifty-five (55) years later I can say I ran through the Eye of Hurricane Carla. What’s your Hurricane Carla Story? Wednesday, September 28, 2016 – Censored, Banned and Read. Here’s to The Librarians and Literature Teachers Everywhere. September 25 through October 1 is National Banned Book Week. I like their slogan – Celebrating the Freedom to Read. My favorite “reason” listed for censorship is “it promotes or provides ideas to young people.” Excuse me? Isn’t that the point of reading? Books like Robert Cormier’s The Chocolate War that always makes a list, was said to be about “bullying.” Sidebar: Remember McC teachers and students of the late ‘70’s – this book was asked to be taken off of the library shelves for that reason plus the phrase of “…fondling the statue’s breast.” I reread The Chocolate War every so often and still think it is a good teaching tool. In fact I reread several on the banned list. I just reread Slaughter House Five (also banned). Billy Pilgrim and PTSD long before it was recognized. There are many lists of books that are banned. Just do a Google search of banned books to find multiple listings. I picked the list of banned books that shaped America. It lists 30 banned books that shaped America. I have read all but three on this list. How about you? Go read a book and celebrate your freedom to read. When I first saw the topic was the problem with periods I thought it was about something else but it is actually about period use in texting so I guess all period can make one passive aggressive. You ever know someone who is a genuine person, except when it comes to text messages? A friend you get along fantastically well with in person, through emails, on Facebook, and so on — but for some reason, when it comes to text messaging, they always seem like they have a really negative attitude? As if the act of texting makes them abrupt, disingenuous, and callous? It might seem hard to believe, but the most innocuous punctuation mark of all is the enemy of friendly text message communication. While a lack of periods would make books, blogs, articles, and even emails almost totally unreadable, the use of periods in shorter form text messages actually does a person no favors. The Monday After Saturday College Football Awards will be posted later today as we pause and pay our respects to the Marlin baseball player Jose Fernandez and to the “The King” of golf, Arnold Palmer. Long Live the King! Assessment Question: Who wrote The Side Step? Vote Early and Vote Often to keep former Governor of Texas Rick Perry on Dancing with the Stars. In spite of the fact that the little person has outscored him twice, let’s continue our support for our beloved. It sounds funnier if one says he got out scored by a midget, but that is politically incorrect. My retirement letter from the state of Texas. I am proudly standing here to humbly see. I assure you, and I mean it- Now, who says I don’t speak out as plain as day? And, fellow Texans, I’m for progress and the flag- long may it fly. I’m a poor boy, come to greatness. So, it follows that I cannot tell a lie. Ooh I love to dance a little sidestep, now they see me now they don’t- I’ve come and gone and, ooh I love to sweep around the wide step, Cut a little swathe and lead the people on. Even though Tom DeLay danced to it, we all want to see RP dance to it again. Am I right? Maybe the song writer herself would perform. I would be happy if you danced to this tune. You could dedicate it to Dolph. Whatever you do, RP, please do not dance to The Aggie Song. I do not think I can handle seeing you shirtless, in boots, tight jeans, a cowboy hat and a smile. Oh that is right. You refuse to wear a hat. The fabulously talented Dolly Parton wrote the lyrics The Side Step. Our vocabulary word for today is: afflatus. It is a noun meaning inspiration; an impelling mental force acting from within. Or a divine communication of knowledge. Today marks the first day of fall. The length of the day and night (light and dark) is the same creating a balance. Since I am sans afflatus today, click on the link below for steps to celebrate the equinox. I am headed out to do number six on the list. I hope your afflatus is working today to make the world a better place. The photos are from the Arboretum in Dallas. Welcome fall. Now get cooler, please! Wednesday, September 21, 2016 – Is It Deer Season Yet?